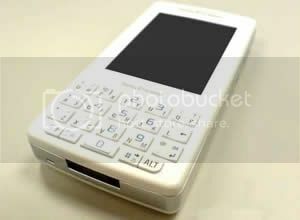 The white Sony Ericsson M600i, made known in February of 2006 will finally be made available in June. The white M600i from Sony Ericsson is a feature-packed emailing device and phone neatly packaged into a fashionable, slim mobile providing a touch screen and handwriting recognition. The Sony Ericsson M600i measures 107 x 57 x 15 mm, and weighs just 112g and is the second Symbian OS 9.1 and UIQ 3.0 enabled phone to be offered by Ericsson. Although the white M600i doesn’t provide a built-in camera it does support UTMS for high speed access through data connections. The price and availability of the white Sony Ericsson M600i is to be considered.